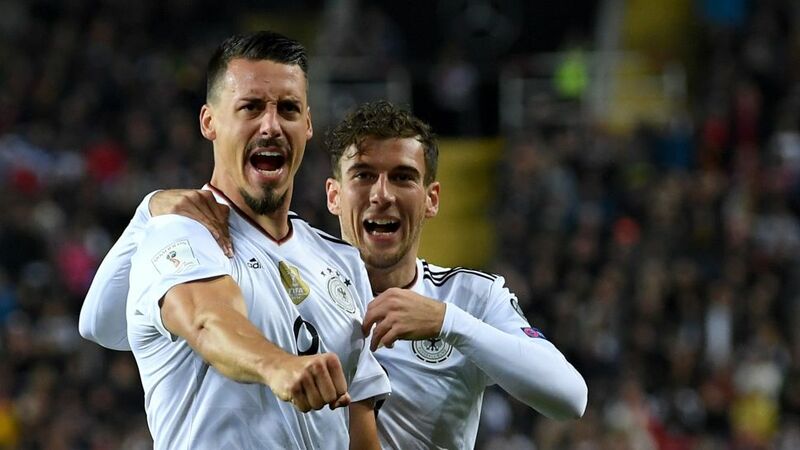 Sandro Wagner has scored five goals in his first seven games for the senior Germany national team. He might have been one of those anonymous players among a clutch of familiar faces you see in old team line-ups, his name on the tip of your tongue while those of many of his former team-mates trip off it. Now, Sandro Wagner has stepped out of the shadow cast by the German football icons he used to play alongside and joined them in the spotlight. It is summer 2009, the venue Sweden, the opponents England. Wagner lines up alongside six future FIFA World Cup winners — Manuel Neuer, Mats Hummels, Jerome Boateng, Sami Khedira, Benedikt Höwedes and Mesut Özil — and scores twice in a 4-0 win that secures Germany’s first-ever European Under-21 Championship title. But while many of the 2009 vintage sped to success and silverware, Wagner’s career pulse all but flatlined for much of the next six years, a handful of highs punctuating far too many lows as he failed to impress at Werder Bremen, Kaiserslautern and Hertha Berlin, scoring just 19 goals in 130 Bundesliga games. It is the sort of return that could send a flagging career into a fatal tailspin and smash an already brittle self-belief. But self-confidence is not something Wagner is short of, stating “I’ve been the best German forward by a mile” midway during the 2016/17 campaign, the second of his incredible renaissance. ‘Renaissance’ is not really the right word. This was not a second coming in his late twenties, it was only the first. In a country where the ‘false nine’ has been turned into an art form, Wagner is a throwback, as old school a centre-forward as they come. The only thing false about him might be his teeth, victims of his devil-may-care attitude to self-preservation when the ball is in the six-yard box and boots and elbows are flying. It was that ethic that convinced Hoffenheim he could help them, and then brought him 11 goals in a successful first season at the Rhein-Neckar Arena. A maiden senior international cap with his country followed, just a couple of weeks short of eight years since he had helped destroy England in Malmö. A hat-trick in the 7-0 World Cup qualifying rout of San Marino shortly afterwards, and Wagner had — finally — announced his arrival on the grandest stage of all, not that he had ever doubted it. Watch: Wagner's Top 3 Bundesliga goals! Had Timo Werner or Mario Gomez been fit, it could be argued Wagner, who has scored four goals in 10 top-flight games for Hoffenheim this season, might not have featured against Azerbaijan in October’s final World Cup qualifier. But they weren’t, he did, and he scored again, to make it five goals in five internationals. The last man to do that? Another player with a Duisburg past, Ronnie Worm, in 1978. By comparison, Miroslav Klose scored twice in his first five Germany games, Jürgen Klinsmann and Rudi Völler just once. Lukas Podolski did not find the net at all. No-one — bar Wagner himself perhaps — is putting the Hoffenheim man in that exclusive bracket. But he looks increasingly likely to be part of the Germany squad that takes on the world in Russia next summer, despite still being largely unloved and under-appreciated. Wagner undoubtedly provides Löw with a very different and still effective alternative to the silkier, slighter attacking midfielders that have become Die Nationalmannschaft’s leitmotif in recent years. Should he be the battering ram around which a successful World Cup defence is built, no-one will have any trouble picking him out of the team photo decades from now. Click here for more Hoffenheim news, views and features!